Matthew Kenu, Sister Patience Yeboah, three other students, Ps. Harrison and Boachie and wife, (8 in all). We got there on Wednesday and came back to Accra on Thursday. We could not go out to evangelise the town on that faithful Wednesday because there was a heavy downfall of rain. However, we were part of the church service at Ps. Dotses church. Pastor Harrison and I, Boachie, spoke briefly to encourage them. 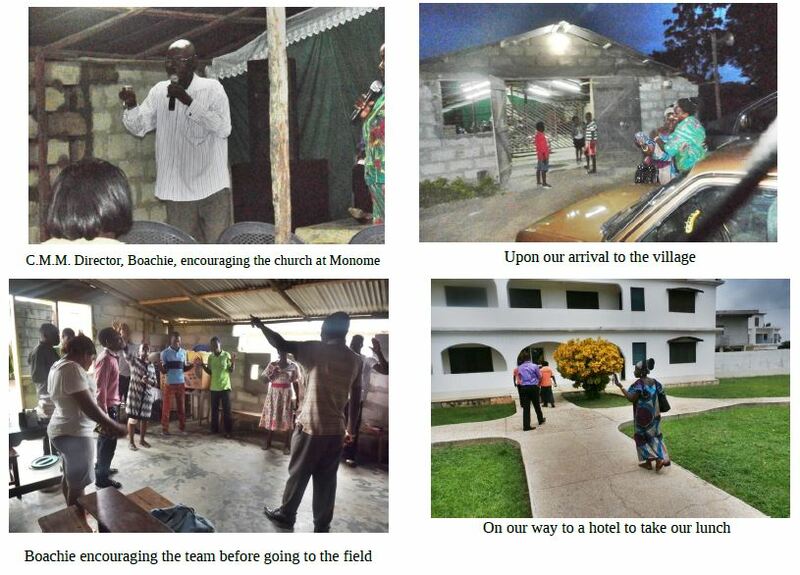 On the following day, some church members joined the team from Accra for evangelization. We divided ourselves into three groups after prayer and set off for the commencement to evangelise the town. Over 20 people were saved with about five people receiving instant healings of different sicknesses including back pain, a pain of the leg and headache. Plans are afoot to visit the town at least once a month to encourage and get them established in the Lord. Our total expenses amounted $230 including our hotel bill, feeding and fuel to and from Accra. Attached are the corresponding photos. Other photos follow in the next email.